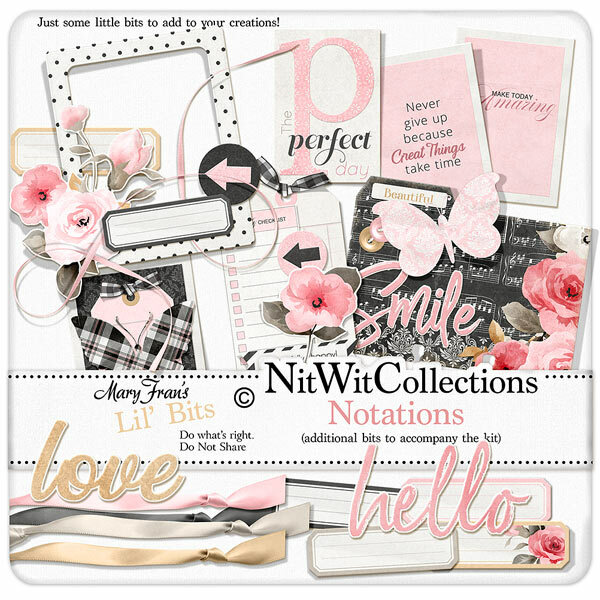 Lil' Bits "Notations" presents you with even more tremendous elements to create your cards, mini albums and scrapbook layouts with. We know you'll want to create multiple items with this eye-catching kit and these Lil Bits ensure that each project is unique and special. Don't miss out on these digital elements as they are not included in the FQB "Notationis" Collection so please don't miss out on owning and creating with these elements! 1 Cluster that sparks joy - "Delightfully Happy"
1 Journal card - "The Perfect Day"
1 Journal card - "Make Today Amazing"
1 Journal card - "Never Give Up...."
1 Rolodex file card that is so inspiring....stop looking at the other elements....just use this one! 2 Digital stamp sentiments - "Love" and "Hello"